To start, I started with Godaddy in the nineties and had a no-issue relationship with the company until 2018. I was just a “I have a website” guy, but didn’t use the site for much. Around May of 2018, I changed my credit card number. My renew-option failed because I did not update my card number and GoDaddy stopped my hosting. I eventually noticed and called Godaddy. My hosting account had been deleted (for a lack of better phrasing). I explained my credit card situation. Godaddy told me that they can go into their database and restore my website, but it would cost over $150. I reminded GoDaddy of our long relationship, where I had never missed a payment for my hosting plan or for the eighteen domain names that I have with them, and that they should take our history into consideration. GoDaddy stuck with their customer business plan. I walked away from a twenty-year relationship and twenty years of web-content after that phone call, refusing to pay the restoration fee. I was the “face-behind-the-money” and didn’t see my loyalty being rewarded. I took my money and left. Fast forward seven months. I want to start a blog. Who do I go to? I called GoDaddy out of “laziness”, not taking the time to look at the many options available. I was familiar with GoDaddy. Violation of “face-behind-the-money” principles, but it is a personal choice to be undervalued or not. I set up my blog with GoDaddy and became an official blogger. I was reading the blogger books. It was exciting. Less than three weeks later my blogsite stopped working properly. I called GoDaddy and they stated that I needed more than 512 megs of RAM, available for a cost of $100 or I could go up to the Business Plan for around $350 for 2 gigs. I responded, “I just started.” I decided to cut my losses and leave GoDaddy again, three weeks after signing with them. I discovered Inmotion Hosting. The two worlds of GoDaddy and Inmotion are very different. I can’t sing the praises for Inmotion because I am just starting with them and doing so will not be fair to GoDaddy, but I can talk about what I have experienced so far. 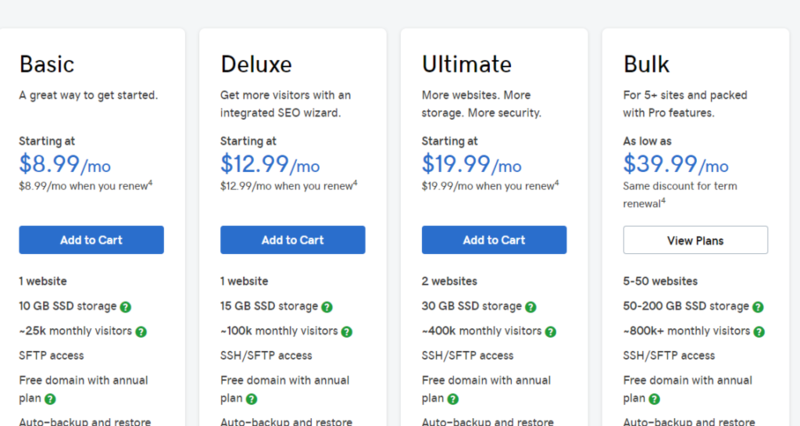 GoDaddy’s and Inmoition’s pricing is below. You can make come to your own conclusions about value for the customer. I want bandwidth and memory to avoid having to always upgrade. I now have sufficient resources. Inmotion is migrating/moving my site for free. 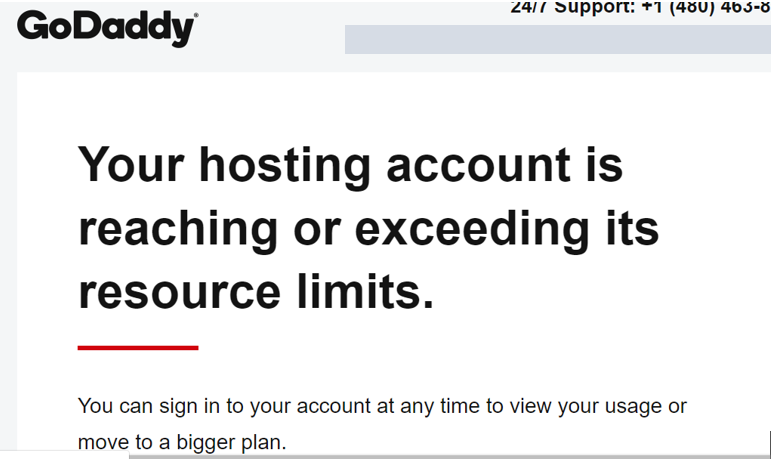 GoDaddy charges one-hundred dollars to migrate a site. Inmotion offers free email accounts. GoDaddy offers at least one free email with hosting. GoDaddy offers 512 megs RAM for an entry-level plan. I was told by Inmotion that I have at least “1gig” of RAM for the plan I now have. I will let you know how it goes with Inmotion Hosting. I am leaving my domains with GoDaddy. They are great company for buying domain names. They are great for “I have a website” people. They are great for anyone that does not mind paying their fees. GoDaddy’s customer service is good and their products are great. For my budget and needs as a blogger, I am hoping that switching to Inmotion is a good choice. I’ll update this blog when I have a better feel for Inmotion. My last piece of advice is to shop around as a blogger for the hosting company that meets your needs. Blogging can become very expensive with the wrong company. Start with the right company, so that you don’t find yourself having to upgrade your blogging resources every three months because of bandwidth, diskspace, and memory needs. I’ll find something to do with the hosting account I left with GoDaddy.